You can order a quality Caricatures drawn from photos by our team of caricature artists and illustrators. All hand drawn and produced using superb art supplies in Canada. Digital caricatures are created for your printing or screen usage. 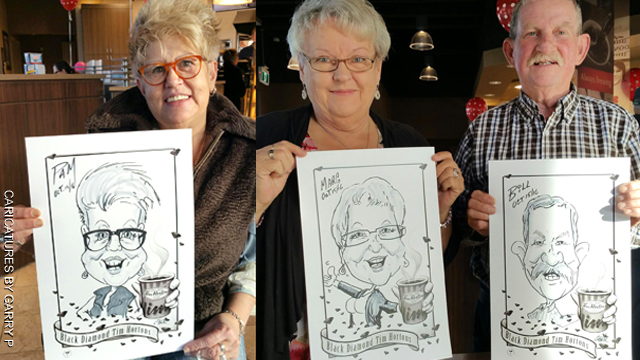 Studio caricatures are superb corporate gifts, wedding presents and more. Order a studio caricature in minutes and have it sent to the receiver`s address. Create a custom caricture right here in a few simple steps. We send you the original caricature painting. Shipping is free anywhere in Canada! We do these with your art directions. Upon receiving the photos a pencil sketch is done and sent to you. Once we receive your feedback we will redraw it incorporating your changes. We repeat this until you are fully satisfeid with the drawing. The cost of the piece depends on the number of people or the overall subject matter of it. The artwork is produced on cotton base premium paper with high quality inks. The digital file is supplied in your preferred format and color scheme in high resolution. If you are printing it using a commercial print shop we would gladly work with them to make sure the quality of the produced material is superb. This portion of the work is free of charge.